The synergy in between ultrasound for medical applications and underwater is vast. It has turned out that the water current and blood flow has some interesting “similarities” from a signal processing point of view. Also, ultrasound is often used in medical applications and the understanding of sensors, inverse filtering, signal processing, non-linear filtering and other approaches are generic and not limited to underwater or medical only. This has become very evident in multiple projects. The system used five (5) ultrasound sensor elements (@ 300 kHz), sampled using an ADC (Analog to Digital Converter), using a 24 kHz sampling rate and proper filtering. The sensor “head” was placed at the bottom of the sea and “pinging” like a bat in all directions (the fifth element was only used for wave height). 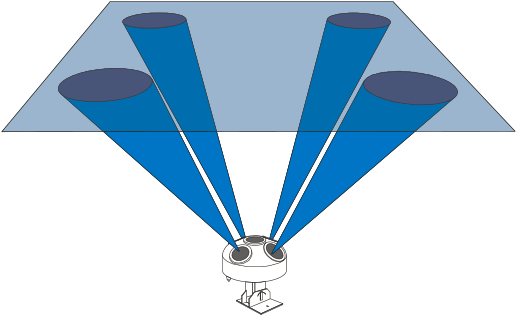 The picture below depicts the sensor head being used. Four elements are used when finding the current vector and the fifth element is used when estimating wave height. Dr. Thomas Lagö has been involved in multiple other projects where ultrasound has been used for measurement applications, not only in medical. One such application was the development of a non-contact vibration measurement system for Volvo’s production line system. By using the same Doppler shift principle as in the above examples, a non-contact measurement of the rear axel vibrations (velocity) could be handled. This was a major factor in keeping measurement time short since no sensors had to be mounted. Traditional accelerometers must be in contact with the measurement object.